Breakfast is my favorite meal and I make hot breakfasts several times a week. Still, we manage to go through quite a bit of boxed cereal at my house. Enough to make me want to do something useful with the cereal boxes before they hit the recycling bin. When I noticed by chance that the boxes of several of our favorite cereals perfectly nested inside each other, I just knew there must be something they would be useful for. 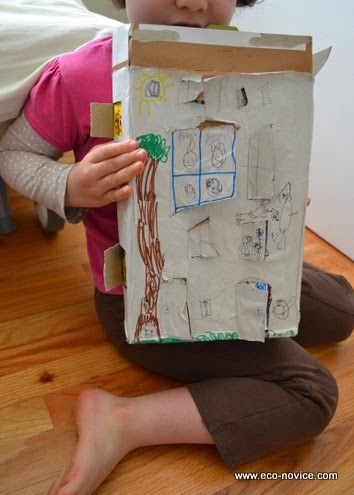 Eventually, I came up with the perfect upcycling project, thanks to my middle child's love of lift-the-flap books (which she calls "peek-a-boo books"). 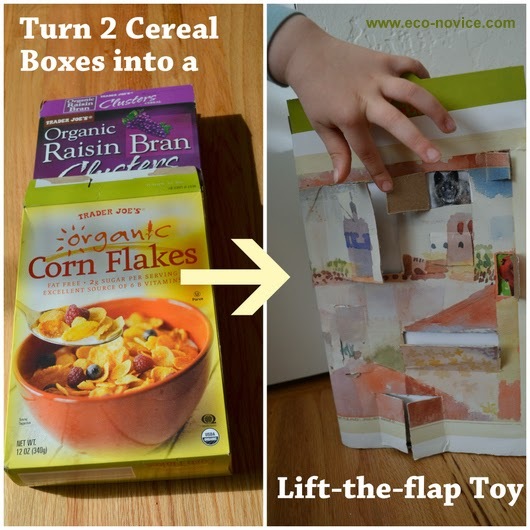 Here's how to turn two ordinary cereal boxes into a fun crafty project that your kids will love making and playing with. We call them peek-a-boo houses at my house. Step 1. 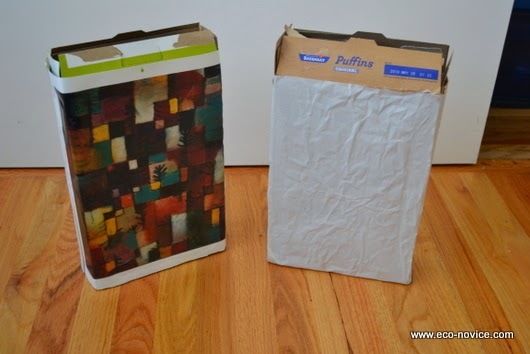 Save two empty cereal boxes that nest inside each other. Step 2. 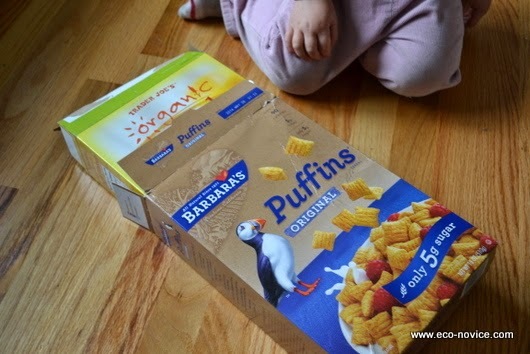 Cover the outside/ larger cereal box. You can use plain paper and decorate it yourself, or use a paper with a design or pattern (repurposed wrapping paper, images from old calendars, and so on). I used some images from my 2013 Klee calendar which my husband had been harrassing me to get rid of for months. See, honey, I knew I'd find a way to reuse it! Step 3. 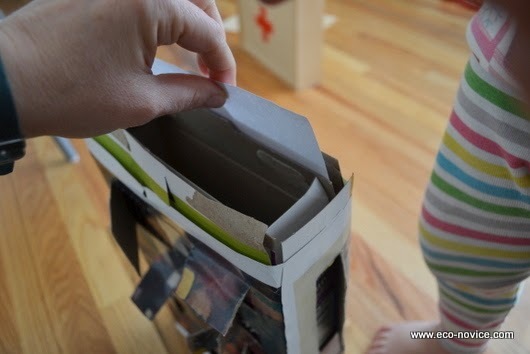 Cut out window shapes in the larger box on all sides. The smaller cereal box should not be inside the larger box for this. As I soon discovered, this will be far less laborious and frustrating if you own a sharp xacto knife designed for cutting cardboard. 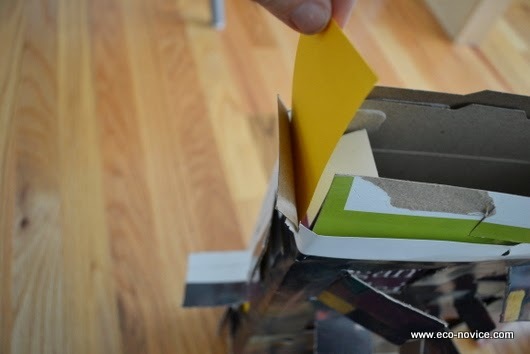 You may need to glue down the paper covering the cardboard flap depending on how thorough you were with your initial gluing. We chose to create a variety of window shapes that opened different directions (left, right, down, up). Step 4. 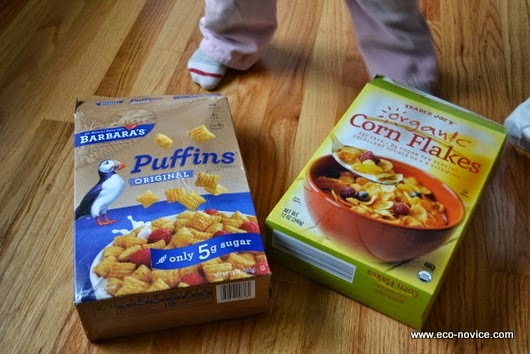 Put cereal boxes inside each other again and then insert paper between boxes on all four sides. 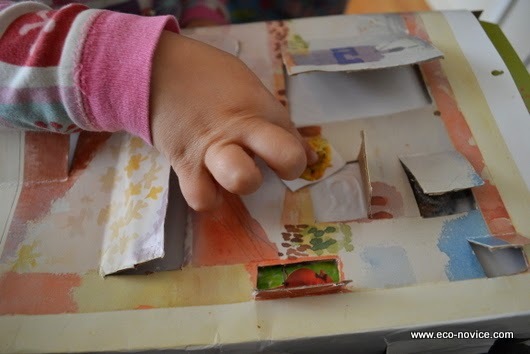 Alternatively you could glue blank paper to cover the smaller box, but inserting the paper works fine and then you can easily swap out the paper for a new one later and have a new peekaboo house without having to use that xacto knife again. Step 5. Trace outlines of windows onto blank paper beneath. Step 6. 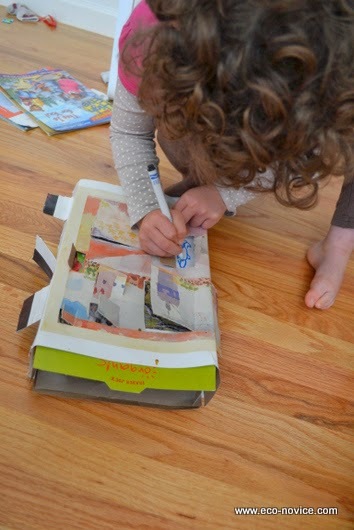 Take out papers and draw or glue images inside the outlines. 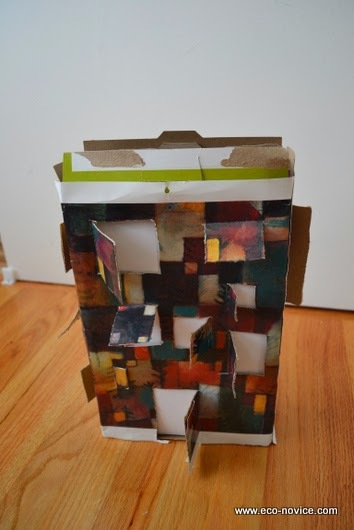 Once glue or art materials are completely dry, reinsert papers between boxes. 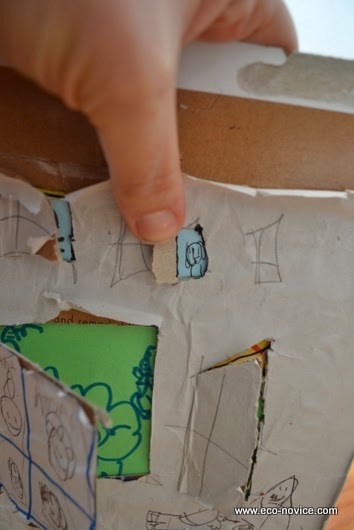 Or, you can skip the tracing and draw and glue right onto the paper while it's between the two cereal boxes. 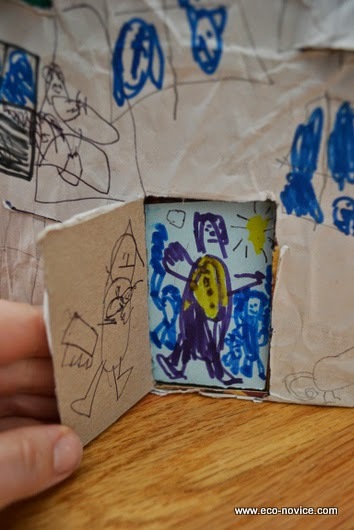 You could also skip the paper between the boxes, draw window outlines onto the inner cereal box using a sharpie, and then glue drawings and images directly onto the inner cereal box the size of those outlines. Having tried it both ways, I think the blank paper between the boxes works better. While I vigilantly cancel catalogs, I often get one or two before the cancellation kicks in. 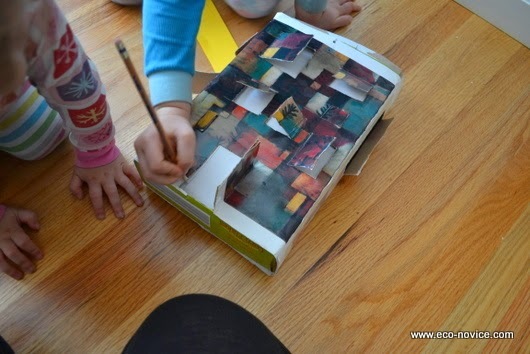 This project is a great way to use unwanted catalogs before recycling. You could also select images or create drawings for windows before cutting the windows, and match the windows to the images rather than the images to the window size. Whatever your preference. Step 6. Enjoy your peekaboo house! 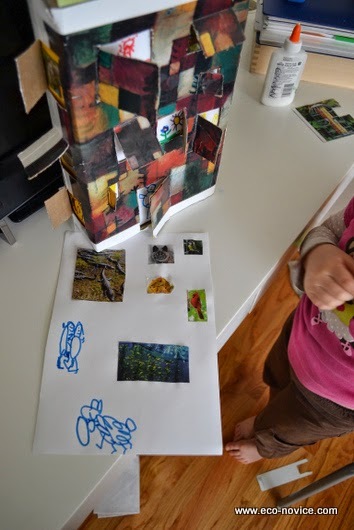 My kids (6, 4, 2) loved this project. 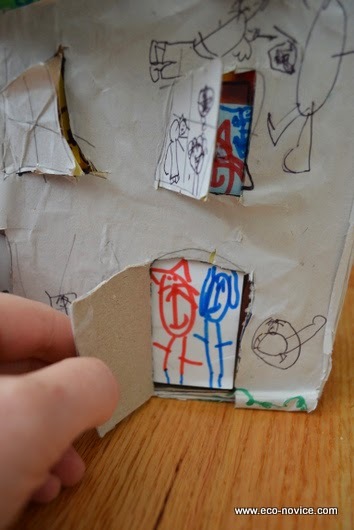 Other than cutting the cardboard windows, they were capable of doing all the other steps alone, from designing the size and location of the windows to selecting, cutting, and gluing (or creating) images. What is your favorite way to upcycle?